The Lord of the temple is praised in the Thevaram hymns of saint Tirunavukkarasar. 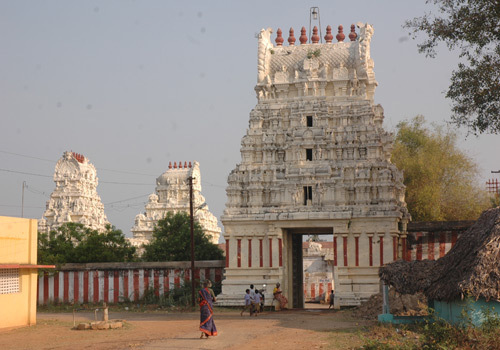 This is the 16th Shiva temple in Thondai Mandalam region praised in Thevaram hymns. 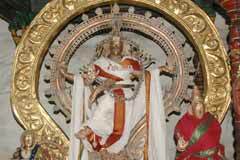 10 day Vaikasi Brahmmotsavam in May-June, Margazhi Tiruvadhirai in December-January and Shivrathri in February-March are the festivals celebrated in the temple. Lord Shiva, a swayambulinga appears on a square peeta in the sanctum sanctorum with a scar on the head, slightly leaning on the left side. As there is a scar on the head, pujas are performed without touching the deity. The Sri Chakra, installed by Sri Adi Sankara is in the Artha Mandapa. 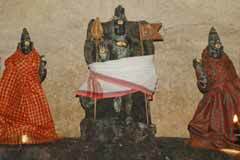 The Linga was found in the bamboo jungle, the Lord is named Pasura Nathar – Pasu-Bamboo. As Lord Shiva removed evils of Perumal, He is praised as “Perumal Vinai Theertha Easwara” gracing from a separate shrine. Sri Vaseeswarar Temple, Tirupasur-631 203. Tiruvallur district. Realizing their wishes, devotees light 11 ghee lamps at Vinayaka shrine and 5 for Sri Chakra. 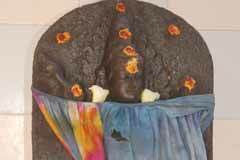 In the competition between Lord Brahmma and Lord Vishnu, the former lied that He had seen the head of Lord Shiva. The palm shaped flower known as Thazhamboo also gave a false witness in His favour. As a punishment, Thazhamboo is not used for any pujas in Shiva temples. As an exemption, Lord Shiva allowed it to be used for the puja only on Shivrathri day. Accordingly, the flower is used only in one puja that day here placing it on the head of the Lord. Worshipping the Lord in this puja would relieve the devotee from the sin of speaking miles and also from arrogant traits. Mother Parvathi had to be born on earth as cursed by Lord Shiva as she went to attend the Yajna of Her father Daksha against His wish. She came to Earth and performed severe penance to join the Lord again. Lord came here saying “Oh! My Sweetheart.” Hence, Mother is named Than Kathali – My Sweetheart. 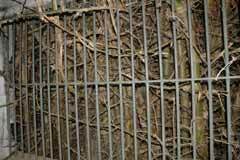 People pray to Mother for conjugal unity. 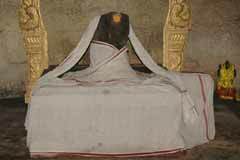 The place is also called Thangathalipuram after the name of Mother. Vinayaka Mandap: For killing demons, Lord Vishnu lost 11 type of wealth of the 16 under His rule. 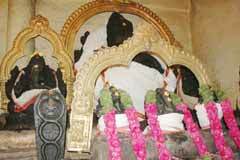 To regain them, He prayed to Lord Shiva and as advised, installed 11 Vinayakas here, according to one story. Remembering this event, there are 11 Vinayakas in a small mandap called Vinayaka Mandap. Three of them are facing east. Behind is a Big Vinayaka among small ones on both sides. Planet Kethu is nearby. Lord Vinayaka is he deity for this planet. The other story attached to this mandap is that it was a court convened by Lord Vinayaka to enquire Lord Shiva for bypassing Him when He marched on the Tripuranthakas. As Shiva proceeded without worshipping him, Vinayaka broke the axis of Shiva’s rath then. He allowed Shiva to proceed after the enquiry and setting right the axis. 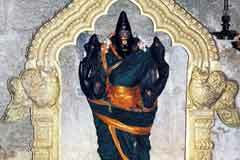 Swarna Kali: A chieftain of this place, Kurumban by name failed to pay his tax dues to the Chola king. Kurumban was a Kali devotee. When the king invaded on him for recovering the dues, the chieftain prayed to Kali who defeated the king and his army. The king came to Lord Shiva for help. Lord sent Nandhi to control and bind Kali. Nandhi defeated Kali and bound Her with golden chain. Remembering this event, Swarna Kali has Her shrine in the temple, her legs bound. Evening pujas are performed to Kali on Full Moon days. Next day, his enemies came there and gave him a pot containing a highly poisonous snake. Before the king opened the pot, a snake charmer came there and caught the snake in it and went away. Lord Shiva appeared in his dream and said that He was the snake charmer and directed him to build a temple in the bamboo forest. The temple thus came into being. Other story goes like this. Demons Madhu and Kaidaba stole the Vedas from Lord Brahmma and hid them under the sea. Brahmma could not continue His creation work in the absence of the Vedas. Lord Vishnu came to his rescue, incarnated as Matsya –Fish, went deep into sea, recovered the Vedas and killed the demons. The killing left their evil marks on Lord Vishnu who prayed to Lord Shiva for a remedy. 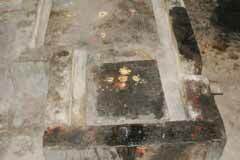 Lord Shiva advised to worship Him in this place for removal of evil effects. Vishnu followed the advice and got remedied. 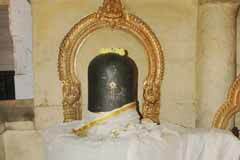 Lord Shiva came out as a Swayambu. Tirpasur is 5 km from Tiruvallur.